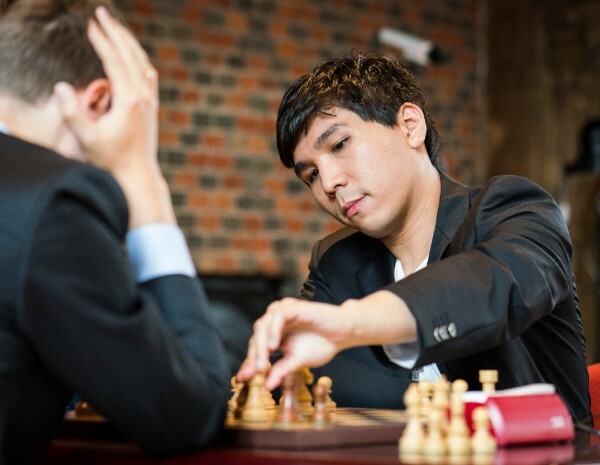 The rapid portion of Your Next Move came to an end with Wesley So winning the rapid portion with a round to spare. He now leads the pack with a comfortable advantage as his closest rivals, Levon Aronian and Maxime Vachier-Lagrave are points behind. The next two days of blitz promise to bring a lot of action and excitement. Since nine games will be played on each day, a bad day for So could mean a complete turn around in the standings. However, in blitz, the wins are only worth one point, thus giving So a big edge over the rest of the field. Wesley So continued his dominance and got close to a big advantage due to Hikaru Nakamura’s reckless opening play. 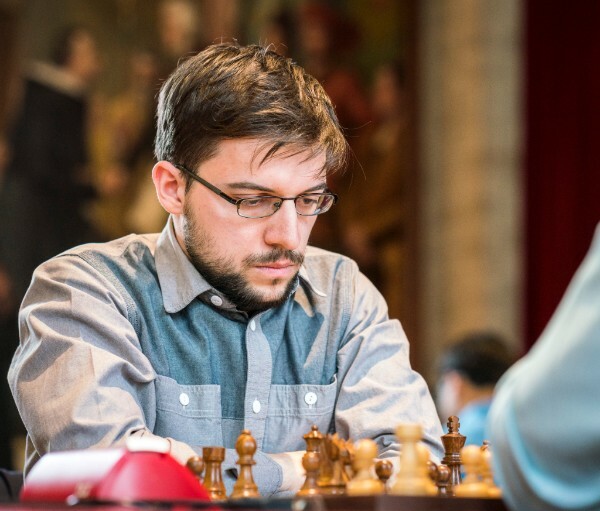 So’s win was effortless, and he extended his lead to three points as his closest rival, Levon Aronian, went astray with his attack and lost to Sergey Karjakin. It was not a good day to have the white pieces as Fabiano Caruana and Alexander Grischuk defeated Anish Giri and Viswanathan Anand respectively with the black pieces. Wesley So secured his win of the rapid section with a solid draw against Sergey Karjakin and maintained his three point lead. 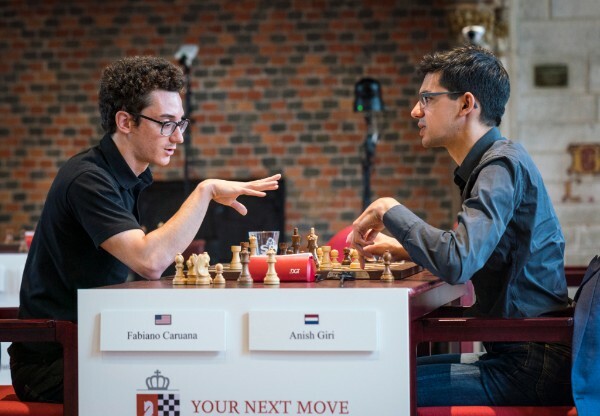 Levon Aronian and Maxime Vachier-Lagrave improved their standings with wins over Fabiano Caruana and Anish Giri, putting themselves behind Wesley and tied for second place with Karjakin. Hikaru Nakamura bounced back from his loss with a win over Anand while Grichuk and Mamedyarov drew their game. There was only one big change in the top standings: Sergey Karjakin lost to Fabiano Caruana while So, Aronian, and Vachier-Lagrave drew. 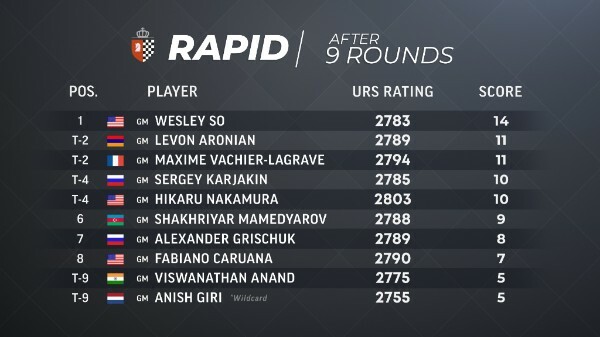 Although none of the players had a chance of winning the rapid, every additional point is crucial for the standings overall. The only other decisive result was between Mamedyarov and Nakamura. Nakamura’s win put the American in fourth place tied with Karjakin. Nakamura is known for his blitz skills and is currently the second highest rated player in the world behind Carlsen and ahead of So. With eighteen rounds of blitz to go, he still has a very realistic chance of winning Your Next Move. Article by Tatev Abrahamyan. All information is available on GrandChessTour.org.